Complimentary parking is available for all events in the Scheman Building, Stephens Auditorium, or Fisher Theater in any lot within the complex. Please note these parking lots are shared with the Iowa State University Athletic Department. View Iowa State Center in a larger map. VIP Parking Passes are a benefit to Performing Arts Fund donors who contribute $300 or more, allowing parking in reserved spaces. 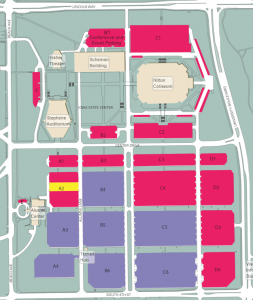 Please show your VIP Parking Pass to the traffic directors for access to these reserved lots. View a map of entrances to Stephens Auditorium.